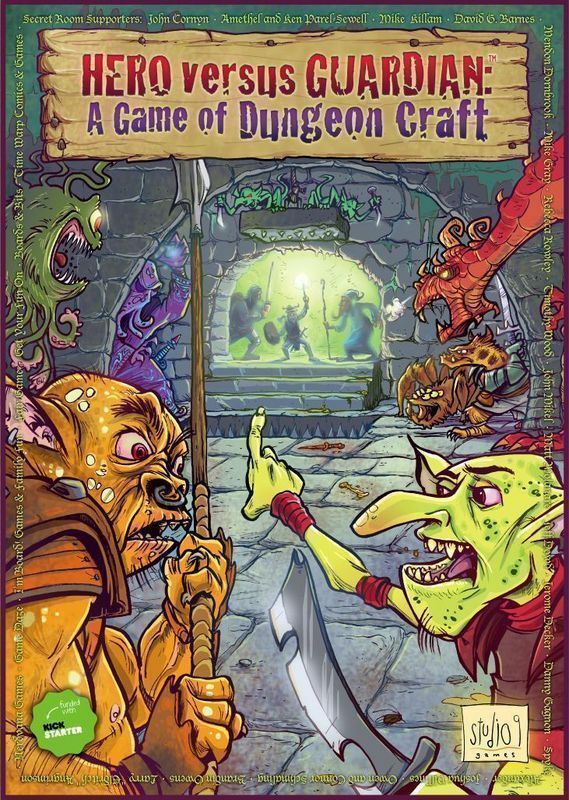 HERO versus GUARDIAN: A Game of Dungeon Craft is a 2-4 player card- and dice-based strategy game that takes 45-90 minutes to play. The game has two distinct roles: the role of the Guardian who builds a dungeon and the role of the Hero who builds a party of adventurers to loot the dungeon built by the Guardian. At the start of the game the Guardian secretly designs a dungeon using a set of 16 room cards. Additional room cards are set aside and drawn from as the game progresses. There are 4 basic room types: Traps, Brutes, Evil and Magic. Brute and Evil rooms are more common and Magic and Trap rooms less common. Each room in the game is unique and has specific ways in which it can assist in the dungeon defense. For example, some rooms, like the RUST BEAST, destroy items, others, like the PRISON CELL, give the HERO player an addition adventurer if the room is captured by the HERO. In addition, there are empty rooms that when coupled with other rooms create a modifier to the chance of that room being overtaken. The Treasure Vault is the most valuable of those rooms and the goal is to keep the adventurers from finding and capturing it. Once the Guardian places entrances outside the dungeon, the game begins. Within a round, players spend tokens to take actions in an alternating sequence. The game combines elements of chance with your ability to read your opponent's strategy. The Guardian and Hero do not HAVE to take an action and can pass and wait to see what the other is doing, however, each round the Guardian has last option which means he or she can act last forcing the hero to either act, or end their turn and turn over all but 1 of their action tokens. In addition, the Hero has first option, meaning if both players wish to act first in a round, the Hero gets to go first. Each player has action tokens to spend on a variety of actions. Players use tokens to make plays during a round. After all players have spent their tokens, a new round begins with a new set of tokens. The Heroes use tokens to prepare adventurers, and move them through the dungeon. Actions include: scouting a room (a less lethal option but slower and thus can waste precious time), venturing a room (a potentially lethal action where the hero charges adventurers into a room), play a card (spell, item or adventurer), draw a card, retreat, or pass. Heroes earn points by defeating rooms. The Guardian uses action tokens to build more rooms into the dungeon, alter room locations in the dungeon, create dungeon effects to slow down the Hero's progress, or draw cards from the dungeon deck. Each card drawn brings the game closer to the end, because when the dungeon deck is emptied the game ends. The Guardian earns points by capturing adventurers and their gear, and by keeping his dungeon rooms from being captured. The game ends either when the Guardian has drawn all the dungeon cards or when the Hero captures the Treasure Vault. A major component of the game is how the Hero moves through the dungeon and captures rooms. The Hero must enter from one of the 2 entrances, and then must always move to rooms that are adjacent (not DIAGONAL) to the entrance, or adjacent to any cleared room connected to the entrance by other cleared rooms. To clear a room the Hero uses action tokens to form a party. Selecting between 1 and 4 of his adventurers with skills suited for the room at hand. The Hero can save time by charging into an unknown room or use action tokens to scout the room and then pick the best party for the job. The advantage of charging is that it saves time and throws off the Guardian, however, it can mean certain death. Scouting is safer, but eats precious time. The Hero is trying to put the best adventurers in the rooms most suited to their skills—while the Guardian tries to ambush and surprise the Hero with rooms that challenge the adventurers. This is where spells (for the Hero) and Dungeon Effects (for the Guardian) help tip the scales of a close combat. The 4 basic Adventurers WARRIOR, ROGUE, WIZARD, and CLERIC each have a room they are best at defeating. However, they are also capable and somewhat skilled in other rooms. In addition they each have a power which gives them strategic advantages, for example the warrior is better at venturing, the rogue at scouting, the wizard can cast spells without eating action points, and the cleric can save party members by sacrificing himself. Using their skills and talents at the right time in a well balanced group can mean the difference between a wipe-out and a victory. Of course, the Guardian can see the party composition and their equipment, but the Hero cannot see what is in the rooms. So the Guardian is constantly shifting and bolstering his rooms to create the most havoc for the party at hand. Equipment also scores points for the Guardian if captured, but is important to boost the adventurers skills vs. various rooms. It also takes time (action tokens) to equip. The advantage of the bonus vs. the consumption of time becomes a key strategic choice. In a multi-player game there are multiple Heroes who each take a turn in sequence against the Guardian. Each Hero builds a party of adventurers and equips them separately. In the end if the Heroes have more combined points they win as a team against the Guardian. The game currently can play 1 to 3 Heroes vs. 1 Guardian.